Nuclear Energy in the World’s Energy Mix. Today there are 439 operable reactors in 31 countries, providing 11% of the world’s electricity. 65 reactors are under construction and another 158 are planned, for a total of 66 operable, under construction and planned. This is marginally higher than the 661 across these categories immediately prior to the Fukushima incident in Japan. France produces about 75% of its electricity from 58 reactors, while 15 other counties generate more than 25% of theirs from nuclear. Prior to Fukushima , Japan generated about 30% of its electricity from nuclear. Since Fukushima, 8 reactors have been permanently shut down, leaving 42 operable reactors, of which 24 are in the process of permitting for restart. The first two reactors were restarted in August and October 2015. There are about 240 research and medical isotope-producing reactors in 56 countries. Small modular reactor (SMR) designs are in various stages of permitting in Canada, USA, UK, China, Russia, Japan and other countries. Argentina is the first country to have actually started construction of an SMR – with completion scheduled for 2018. Argentina’s SMR, the CAREM 25 model is a 25 megawatt (MW) unit. Most SMRs are in the 10-300MW range, whereas the newer, large, conventional reactors typically generate upwards of 1,000MW (1 gigawatt). Most SMRs use the basic design of reactors that have been used to power ships and submarines for over half a century, for use in areas of poor infrastructure. SMRs would be built in a central facility and should be significantly cheaper per unit of power output than the traditional, large reactors. These units are small, some are 3 metres or 10 feet in diameter, and would be shipped by truck or train to site where they could be located underground in clusters depending on the amount of power required. When they run out of fuel, the units would simply be replaced and the spent units returned to the factory for refueling. SMRs have a very small footprint – they could be located in a park adjacent to a city, and they do not need to be linked to regional power grids, obviating the need for, the cost and environmental impact of, regional high tension power lines that typically link cities. World electricity demand is growing at about twice the rate of its general energy requirement. This trend is due to the astonishingly fast rate of urbanization – 70% of the world’s population is predicted to live in urban areas by 2050, up from 54% in 2014 and 30% in 1950 – and the fact that these people can no longer use other sources of fuel (such as wood) for warmth and cooking in an urban environment. To put this in context, these numbers mean that 1 million people throughout the world are moving to cities per week. Add to this the United Nations’ estimate that the world’s population will reach 8.7 billion by 2035 and 9.7 billion by 2050, from 7.4 billion in 2016, compounds the world’s need for energy and electricity. The world’s urban population is expected to grown by 2.5 billion by 2050 – that’s 1.4 million people per week. Reductions in green house gas emissions and pollution in general demands that the electricity demand is filled by clean energy sources such as nuclear and renewables at the expense, particularly of coal, which provided 30% of the world’s energy, and is still the largest generator of electricity, providing 39% of the world’s output in 2014 (IEA, The Shift Project Data Portal). Not surprisingly, the countries that have the highest rate of urban population growth are India, in which 404 million people will move to cities by 2050, followed by China at 292 million and Nigeria by 212 million. 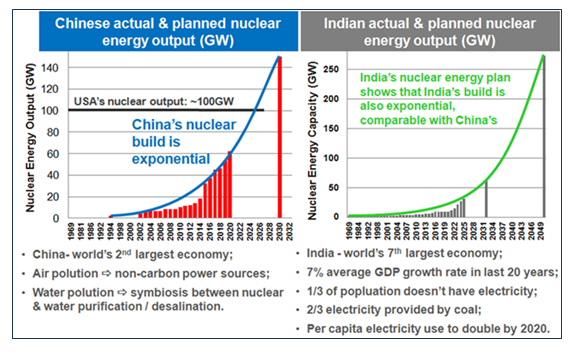 Not surprisingly, China and India have the fastest reactor build plans – in which the number of planned reactors rises exponentially – as illustrated in the graphic below. China currently has 26 reactors under construction, India has 6 and Nigeria is contemplating the installation of nuclear plants. Nuclear energy output versus fossil fuels. Nuclear energy is increasingly viewed as a proven, clean air alternative to fossil fuels. Nuclear energy in comparison to renewable forms of energy. Nuclear is a cost-effective supplier of continuous, reliable, base-load (24/7) electricity that has a low-carbon footprint. To clarify the description of nuclear energy being “low-carbon” – nuclear power stations do not emit greenhouse gases – however mining, processing and transport of uranium does emit some of these gases. The prospect of using renewable wind power to generate at least some of the electricity needed to power the mining fleet and processing plant at U3O8 Corp.’s Laguna Salada Deposit in Argentina would yield a source of uranium with a minimal greenhouse gas footprint. The cost of installation and operation and the durability of wind turbines and solarvoltaic cells have been falling over the last decade, and hence renewables are becoming more cost-competitive. The single biggest challenge with renewables is power storage – battery systems that can store the power for use when the wind isn’t blowing or the sun isn’t shining. Exciting advances are being made in battery technology and our responsibility is to ensure a supply of commodities to the battery industry at a stable price that works for both the supplier of commodities and the battery manufacturing industry. Vanadium from U3O8 Corp.’s Laguna Salada Deposit and vanadium, nickel and phosphate from its Berlin Deposit are all commodities that are used in lithium ion and vanadium redox batteries. In addition, some of the rare earth elements from the Berlin Project are also used to make high-strength magnets that are the key component of high-efficiency electric motors as well as for generators such as those used in wind turbines. In tropical and sub-tropical environments where much of the untapped hydroelectric potential lies, seasonal fluctuation in lake levels results in the vegetation that grows on the banks of the lake as the water level recedes in the dry season being drowned as the water level rises in the wet season. The methane generated from this drowned vegetation is a greenhouse gas that has an atmospheric warming effect that is over 30 times higher than carbon dioxide (CO2). Conversion of Uranium to Nuclear Energy. Before uranium can be used to fuel a nuclear reactor, it must be mined, processed into yellowcake (U3O8) and used to manufacture fuel rods that are inserted into reactors. Spent fuel then needs to be stored in safe sites. The whole process from mining to spent fuel storage is called the uranium fuel cycle. Mining and Milling – The uranium fuel cycle begins as ore – rock containing an unusually high concentration of uranium – which is mined, transported to a mill where the ore is ground and this very fine material then enters the metallurgical plant where various chemical processes are used to extract the uranium. Once the uranium is dissolved from the ore, it then needs to be precipitated or stripped from the fluid in which it is dissolved (the pregnant liquor solution or PLS). The uranium concentrate so produced consists of a mixture of uranium oxides, mainly U3O8, and this mixture is called yellowcake. The yellowcake is a fine powder that is packaged in and sealed in specially-designed steel containers for shipping. Conversion, Enrichment and Fuel Fabrication – About 15% of the world’s nuclear energy is generated from reactors, such as the Canadian designed CANDU and British Magnox models, that run on natural uranium. The term “natural” refers to the ratio of uranium isotopes in the fuel being as found in nature – that is, about 0.7% of the uranium is in the U235 isotope and the remainder is in the U238 (99.3%), with a minute amount in the U234 isotope (0.0055%). Yellowcake, in which most of the uranium is in the U3O8 form, can be directly converted to UO2 (uranium dioxide) to fuel these heavy water – and graphite – moderated reactors. Light water reactors require enriched uranium which contains a higher proportion of U235 – enriched to 3-5%. Note that nuclear weapons require about 90% U235 – this involves a huge amount of enrichment from the 0.7% U235 contained in natural uranium. The first step in processing uranium into fuel for light water nuclear reactors is its conversion to uranium hexafluoride (UF6), which is solid at room temperature, but is a gas at temperatures above 57°C. The principal commercial methods of enrichment of the U235 are by centrifuge or gaseous diffusion, although other methods, such as laser processes, are being investigated. Thirteen countries have commercial enrichment facilities – the main ones being in France, USA, Japan, Germany, Netherlands, UK, Russia and China. In South America, Argentina and Brazil have enrichment facilities. The enriched uranium is made into ceramic fuel pellets that are sealed in zirconium alloy tubes – the fuel rods that are assembled into bundles that are easier to manipulate in the reactor core. Refueling is done every 1-2 years at which time about a third of the fuel assemblies are removed and replaced in the core of the reactor. Control rods are made from neutron-absorbing materials such as cadmium, hafnium or boron, and are inserted or withdrawn from the core of the reactor to control the rate of reaction. The insertion of control rods results in more neutrons being absorbed so there are fewer available for fission with uranium, and withdrawal of the control rods allows more of the neutrons to drive the uranium reaction, which generates more heat. One fuel pellet – the size of a fingertip – can produce as much energy as about 150 gallons of oil. Seven fuel pellets produce enough electricity to meet the annual needs of the average home. Nuclear Power Generation – Energy-generating nuclear, or power, reactors are designed to capture the energy that is released as heat when atoms are split, whereas research reactors are designed to produce and capture neutrons produced by the nuclear reaction for use in diagnostic medicine, for example. Once inside a power reactor, the enriched uranium in the fuel bundles is activated to begin fission in which the splitting of the U235 atom releases energy in the form of heat. The heat is then converted to steam to drive turbines that, in turn, drive generators that produce electricity. Waste Management – Nuclear power is the only energy-producing industry which takes full responsibility for all its waste, and waste disposal is fully priced into the sales contracts. Tailings – the residues left after the uranium has been extracted from the ore in the mining and milling process – require careful management. The plan for Laguna Salada Deposit would be for four clay-lined cells to be built in an area of the project that has an impermeable shale base. Fine-grained tailings from the processing plant would be pumped to one of the cells where the contained water would evaporate, leaving solid tailings. When the first cell had been filled to design capacity after about 2½ years, the cell would be capped with a clay layer that would trap residual radiation emanating from the solid tailings. A 2 metre thick layer of gravel would cover the clay cap and this would be re-vegetated with indigenous plants so that the tailings cell would blend in with the adjacent gravel mesas. Wells would be located around the tailings facility as a means of monitoring the integrity of the facility – to confirm that no radioactivity was seeping out of the facility. The design of U3O8 Corp.’s Berlin Project allows for the tailings from the processing plant to be mixed with cement and pumped back underground to refill the excavations from which the uranium-bearing rock had been mined. This “backfill” material would provide support and stability for the underground mine. Tailings in excess of the underground storage space would be piped downhill to a flat, dry area that is underlain by impermeable rock, providing a stable and secure location for long-term tailings storage. The design and monitoring of the tailings facility would be similar to that described for Laguna Salada. Used fuel that is removed from nuclear reactors consists of a mixture of radioactive waste and unused nuclear fuel that requires secure, long-term storage. Immediately upon removal of spent fuel from a reactor, it is temporarily stored on-site in special-purpose pools until its heat and radioactivity dissipates to the extent that it can be safely transported. 96% of the uranium in the reactor waste can be recycled and the remainder is transported to a permanent federal disposal site. The amount of radioactive waste generated by reactors is small – a typical 1 gigawatt reactor will produce about 20 metres3 (27 tonnes) of spent fuel per year. The world-wide nuclear electricity industry has generated 75,000 tonnes of waste over a 40-year period. To put this in perspective, if this spent fuel was to be packed onto a football field, it would be stacked to a height of 8 metres or 25 feet. Spent reactor fuel undergoes encapsulation to minimize health and environmental risk. Encapsulation involves binding the nuclear waste in insoluble synthetic rock or fused within borosilcate glass which is packed in stainless steel containers that are sealed and stored in an underground facility excavated into solid rock. The space between the containers, and between the containers and the rock walls of the underground chamber, are packed with impermeable fill such as bentonite clay.